Very Cheap Malaysia Airlines Business Class Fares ex Bangkok & Phuket Are Back – Great For BA Tier Points !! Malaysia Airlines has been running Business Class sales ex Thailand to various destinations worldwide which are great to collect Status Miles/Credits, especially if you credit to British Airways Executive Club. 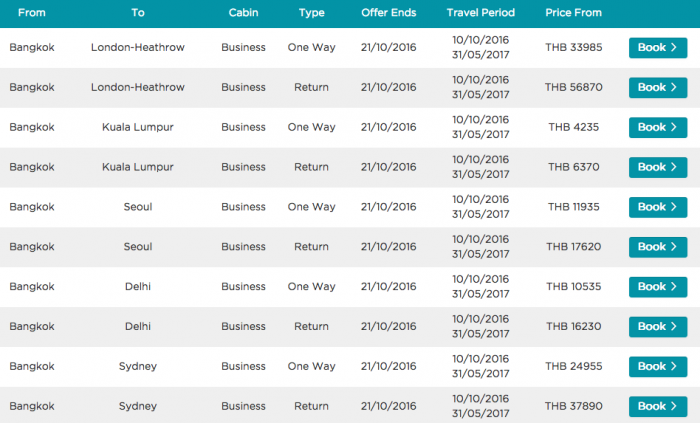 This promotion is finally back with flights originating from Bangkok and Phuket with fantastic fares within Asia as well as to Australia, New Zealand and the UK. The booking window always varies so I felt it might be a good opportunity to once again bring this to the attention of our LoyaltyLobby readers in the region who might be able to utilize it. There are many destinations which I will list below, however for the purpose of maximizing your status credits with British Airways it is key to select flights that are over a certain threshold to jump from just 40 Tier Points for shorter flights (such as the feeder BKK-KUL) up to 160 Tier Points for the connection depending on distance. You can access the landing page for this sale on Malaysia Airlines website here. The lowest fares are out of Phuket (HKT) with fantastic prices especially to long haul destinations in Australia and New Zealand as well as London Heathrow. Once you consult the website you see plenty of additional destinations available so you might want to have a look there to see if there is something that suits your needs. There is a pretty significant difference for example on the London fare where the price ex Phuket is 15,000 THB cheaper so it might be worth it to take a short domestic flight to HKT for 1,000-1,500 THB per way to catch the lower fare and save some extra money. Unfortunately this time around the previously filed fares to Beijing, Shanghai and Taipei are not available under this sale but Seoul, Osaka and Tokyo are. These fares have many advantages since the destinations are actually very nice and useful for a holiday or business trip. You can incorporate many cities in one ticket through open jaw options and even go as far as include an overnight (transfer up to 24h) in Kuala Lumpur for the same price. These fares have been coming and going for the last two years but weren’t available for at least 2 months now. You can collect plenty of Tier Points or qualifying miles with these fares and at a very low price. Less than 1000 USD in Business Class to Australia and New Zealand or 1,200$ to the UK is crazy. Seoul and Tokyo ex Bangkok are great as well starting at 350-400 USD per Ticket.